The relation of procalcitonin (PCT) plasma concentrations comparedwith C-reactive protein (CRP) was analyzed in patients with different severityof multiple organ dysfunction syndrome (MODS) and systemic inflammation. PCT, CRP, the sepsis-related organ failure assessment (SOFA)score, the Acute Physiology, Age, Chronic Health Evaluation (APACHE) II scoreand survival were evaluated in 40 patients with systemic inflammation andconsecutive MODS over a period of 15 days. Higher SOFA score levels were associated with significantly higherPCT plasma concentrations (SOFA 7-12: PCT 2.62 ng/ml, SOFA 19-24: PCT15.22 ng/ml) (median), whereas CRP was elevated irrespective of the scoresobserved (SOFT 7-12: CRP 131 mg/l, SOFT 19-24: CRP 135 mg/l). PCT ofnon-surviving patients was initially not different from that of survivors butsignificantly increased after the fourth day following onset of the disease,whereas CRP was not different between both groups throughout the wholeobservation period. Measurement of PCT concentrations during multiple organdysfunction syndrome provides more information about the severity and thecourse of the disease than that of CRP. Regarding the strong association of PCTand the respective score systems in future studies we recommend evaluation alsoof the severity of inflammation and MODS when PCT concentrations were comparedbetween different types of disease. Procalcitonin (PCT) is a precursor protein of the hormone calcitonin with a molecular weight of approximately 13 kDa. PCT is induced in the plasma of patients with severe bacterial or fungal infections or sepsis [1,2]. PCT concentrations up to 1000 ng/ml and above are observed during severe sepsis and septic shock [2,3,4,5]. Local bacterial infections, viral infections, autoimmune and allergic disorders do not induce PCT. At present, it is not clear whether PCT is predominantly influenced merely by inflammation induced by microbial infections, or also by the severity of multiple organ dysfunction secondary to the systemic inflammatory response. Recent investigations have mainly focused on sepsis-related severity scores, eg the American College of Chest Physicians/Society of Critical Care Medicine Consensus Conference (ACCP/SCCM) criteria [6,7,8] or related scores [9,10], but have not yet examined the relation of PCT concentrations to multiorgan dysfunction independent from the etiology of sepsis. However, in severely ill patients presenting with symptoms of systemic inflammation or septic shock, the presence or absence of a significant infection cannot always be specified, eg positive bacterial cultures can be isolated with increasing quantity in patients with increasing severity of disease . We thus investigated the relation between PCT concentrations and the severity of organ dysfunction assessed by the sepsis-related organ failure assessment (SOFA) score in patients with multiple organ dysfunction syndrome (MODS) secondary to systemic inflammation of infectious or non-infectious origin. The SOFA score is a multiorgan dysfunction score system and estimates organ dysfunction (Table 1) . We also measured the Acute Physiology, Age, Chronic Health Evaluation (APACHE) II score  and compared PCT with the widely known marker of the inflammatory response, the acute phase C-reactive protein (CRP). Since PCT is also reported as an interesting parameter to estimate the prognosis of sepsis and severe systemic inflammatory response [4,10,14,15,16,17,18,19], we also compared the course of concentrations in patients when classified as survivors and non-survivors. The sepsis-related organ failure assessment (SOFA) score evaluation system of multiple organ dysfunction . Six organ systems are evaluated as a scale of 1-4 each. The arithmetical sum of these six is the value of the SOFA score. aAdrenergic agents administered for at least 1 h (dosesare given in μ g/kg/min). MAP, mean arterial pressure. Forty patients of an anaesthesia and surgery intensive care unit in a tertiary health care institution were prospectively included into the study when systemic inflammatory response syndrome (SIRS) or sepsis criteria according to the ACCP/SCCM definitions  were fulfilled for a period of no longer than 24 h. Patients with SIRS or sepsis were not separately analysed, since distinction between infectious and non-infectious etiology of systemic inflammation and MODS is often difficult in severely ill patients, and this was not an objective of our study. PCT and CRP plasma concentrations, the SOFA score  and the APACHE II score  were determined daily on observation day 1 to 5, and on days 8 and 15 after onset of symptoms of SIRS or sepsis. Patients were followed-up for 28 days and were then assigned to the group of survivors and non-survivors, respectively. Sixteen patients survived and 14 patients had a lethal outcome in the further course of the disease within the 28-day observation period. PCT was measured by an immunoluminometric 'LUMItest®PCT'-kit (B.R.A.H.M.S. - Diagnostica GmbH, Berlin, Germany) and CRP by the 'Turbi-Quanti' method (Behring, Marburg, Germany). The correlations between the SOFA score and CRP and PCT concentrations were calculated. Since PCT concentrations were not normally distributed, PCT data were analyzed using four categories of the SOFA to which patients were assigned, and the median and 25/75 and 10/90 percentiles were determined. Differences of median PCT levels between these SOFA groups were analyzed by the Mann-Whitney U test. By definition of four categories, data were comparable with other semi-quantitative scoring systems of the septic response, eg the previously published relation to ACCP/SCCM criteria [4,5]. Significance was assumed when P < 0.05. Forty patients with SIRS or sepsis were included in the study and finally evaluated on a total of 316 observation days. Fourteen patients died from their underlying disease during the observation period of 28 days. The data at the time of enrolment (observation day 1) are shown both for survivors and non-survivors (Table 2). 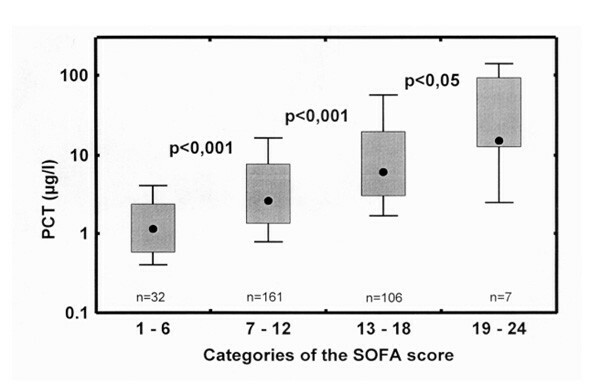 For all patients observed, PCT and CRP concentrations within the four groups of increasing categories of the SOFA score are shown in Figs 1 and 2. Median of PCT concentrations significantly increased with increasing SOFA score levels of the patients (Fig 1). In contrast, CRP concentrations were found highly elevated also at low SOFA scores and showed no significant difference between these groups (Fig 2). Only a few measurements detected very high PCT levels, whereas the majority of the PCT concentrations are in the intermediate range. Thus, correlation coefficients between PCT levels and SOFA scores were low (r = 0.20). Likewise, there was only a weak correlation between SOFA scores and CRP levels (r = 0.19). Similar data were obtained for the APACHE II score (r = 0.17 and r = 0.07, respectively; Table 3). During the first 4 days after the onset of systemic inflammation and MODS, PCT concentrations of patients who survived were not significantly different from those who died (Fig 3). In both groups, median PCT concentrations initially declined, indicating a decrease of the initially observed systemic inflammation during the further course of the disease. This decline continued in the group of patients who survived, whereas PCT concentrations started to increase in the non-survivors after observation day 4 (P < 0.01). CRP levels were marginally higher in patients who survived than in non-survivors. 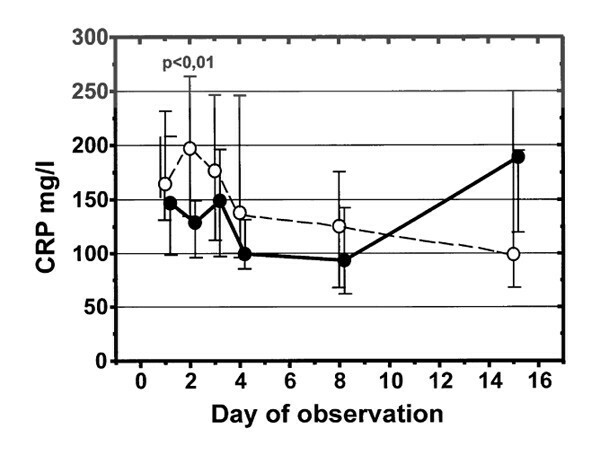 However, plasma concentrations were not significantly different between survivors and non-survivors on all observation days except day 2 (197 versus 129 mg/l, P < 0.01) (Fig 4). 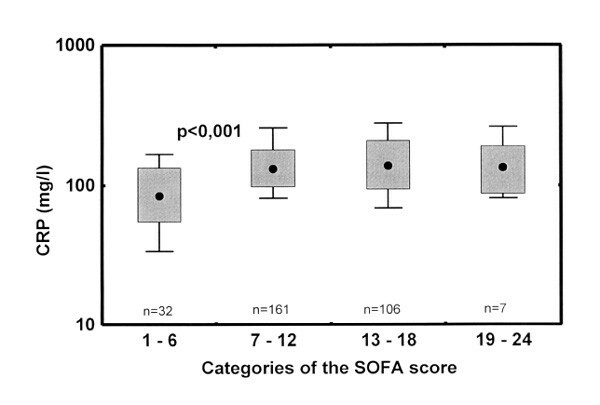 Procalcitonin (PCT) plasma concentrations of patients within fourcategories of the sepsis-related organ failure assessment (SOFA) score.Indicated are median (◎), 25/75 percentiles (box) and 10/90 percentiles(whisker) of PCT observations (n) obtained from 40 patients during a15-day observation period. *P <0.05 compared with thepreceding category (Mann-Whitney U-test). Plasma concentrations of the corresponding C-reactive protein(CRP) concentrations of patients within four categories of the sepsis-relatedorgan failure assessment (SOFA) score. Indicated are median (◎), 25/75percentiles (box) and 10/90 percentiles (whisker) of CRP concentrations(n) obtained from 40 patients during a 15-day observation period. *P <0.05 compared with the preceding category(Mann-Whitney U-test). Course of procalcitonin (PCT) plasma concentrations in 40 patientsduring 15 days after onset of sepsis or multiple organ dysfunction syndrome(MODS). Indicated are median and 25/75 percentiles (whiskers) of PCTconcentrations of 14 patients with a lethal outcome. (◎, solid line)during a 28-day observation period due to the underlying disease, and of 26patients who survived (∷, dashed line). The course of C-reactive protein (CRP) plasma concentrations in 40patients during 15 days after onset of sepsis or multiple organ dysfunctionsyndrome (MODS). Indicated are median and 25/75 percentiles (whiskers) of CRPconcentrations of 14 patients with a lethal outcome (◎, solid line)during a 28-day observation period due to the underlying disease, and of 26patients who survived (∷, dashed line). m, Males; f, female; SOFA, sepsis-related organ failureassessment; APACHE, Acute Physiology, Age, Chronic Health Evaluation; PCT,procalcitonin; CRP, C-reactive peptide. Indicated are median, 25/75 percentiles and 10/90 percentiles ofPCT concentrations obtained from 40 patients during a 15-day observationperiod. *P 0.0001, versus the preceding category(Mann-Whitney u-test);n, number of observations. CRP, C-reactivepeptide; APACHE, Acute Physiology, Age, Chronic Health Evaluation. Our results indicate that PCT concentrations are associated with the severity of MODS as assessed by the SOFA score. These results are in general agreement with studies in which PCT levels were compared with the severity of sepsis by sepsis-related score systems. The similar observations made by sepsis-related score systems of the inflammatory response and MODS-weighted score systems can be explained by similar pathophysiological alterations occurring during advanced states of sepsis and MODS. Increasing PCT concentrations were previously reported by Zeni et al  and Oberhoffer et al  during more severe stages of sepsis (severe sepsis and septic shock) as defined by the ACCP/SCCM criteria [7,20]. Also, other authors observed high concentrations of PCT during septic shock, and comparable low concentrations during SIRS or less severe systemic inflammation. In a study by Al-Nawas et al , very low PCT concentrations were measured during SIRS, but high concentrations when septic shock was diagnosed. Similar results were published by Gramm et al  and by other authors [1,9]. None of these authors, however, analyzed the severity of multiple organ dysfunction rather than the severity of sepsis and systemic inflammation and there are no data available as to the relation of PCT concentrations and the severity of multiple organ dysfunction during systemic inflammation. By using the SOFA score, we thus focused particularly on the extent of multiorgan dysfunction rather than the severity or type of inflammatory response or infection. This approach is closer to clinical conditions, since in severely ill patients the presence or absence of a significant infection cannot always be specified . With increasing categories of the SOFA score, reflecting the severity of MODS, higher PCT concentrations were observed. However, PCT should not serve as a surrogate marker for the severity of MODS, since the correlation of PCT concentrations and score values is weak. These findings have an impact on the interpretation and design of comparative clinical studies using PCT. When PCT levels are to be compared between different groups of patients, eg for purposes of differential diagnosis, assessment of the severity of the disease and of systemic inflammation, including the severity of MODS, is mandatory. When patients were not stratified clearly enough for severity of MODS and systemic inflammation in clinical studies, imbalances between groups as to the severity of MODS or sepsis may significantly influence the significance of different PCT concentrations between the respective groups. We therefore suggest that in future studies score systems evaluating not only the severity of systemic inflammation, but also of MODS should be assessed along with PCT concentrations. This way, imbalances between groups as to severity of inflammation or MODS can be minimized. PCT has several advantages in severely ill patients compared with CRP. The most striking one, demonstrated in this study, is the enormous range of PCT reactivity resulting in a marked increase in PCT plasma levels, especially during severe stages of MODS and systemic inflammation. On the other hand, PCT concentrations are quite low when only a moderate organ dysfunction or a weak systemic inflammatory response is present. In contrast, CRP levels are often found to be already increased to maximal concentrations in patients with low SOFA scores. Thus, CRP cannot provide information as to further increases in organ dysfunction and the inflammatory progress, respectively, since it is already increased to its maximum values during a less severe stage of disease. Further advantages of PCT are its more rapid kinetics; PCT reacts faster than CRP both during an increase or decrease of inflammation. Although data were not presented, a more rapid increase of PCT was observed also in this study . 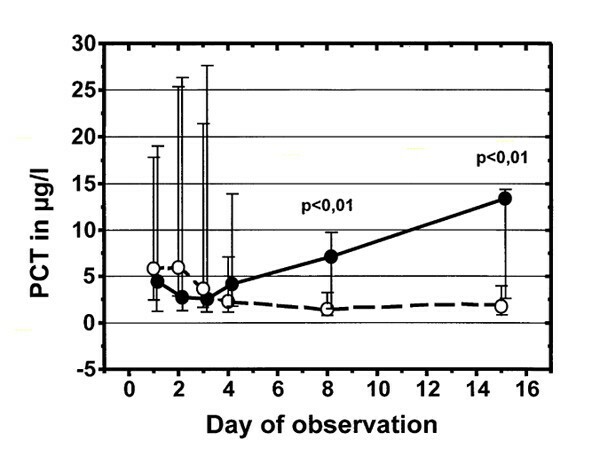 This observation was already described by several authors and thus is not focused on within this study, eg after experimental administration of lipopolysaccharide  or accidental application of a microbial contaminated infusion , where PCT increased within 6h after the initial stimulus and CRP did not significantly increase before 12h after onset of induction. Also, under clinical conditions, a more rapid increase of PCT compared with CPR was described after the onset of severe inflammation . Moreover, the decline of PCT concentrations occurs more rapidly than that of CRP [2,23]. In this study, a rapid decline of PCT levels in patients who recovered and survived was also observed (Fig 3), whereas CRP increased for several days even after recovery and discharge of the patient from the intensive care unit (Fig 4). Regarding the prognosis of the disease, the course of PCT after day 4 from the onset of systemic inflammation was able to distinguish survivors from non-survivors. Until day 4, PCT concentrations were not statistically different in the groups. Likewise, the initial height of the PCT concentrations did not correlate with the further course of the disease. The results of this analysis should not be over-interpreted. The number of patients is too small and too heterogeneous for a general conclusion regarding the absolute height of PCT concentrations and estimating the prognosis of the disease by PCT. In a clinical study, Ober-hoffer et al report high PCT levels in patients with poor prognosis already during the onset of the disease . Further studies support the notion that the course of PCT concentrations rather than the absolute height is a mirror of the systemic inflammatory response and plays a major role for prognosis [4,10,18,19]. Also with regard to this aspect, PCT is superior to CRP, since patients with a lethal outcome were not distinguished by CRP at any time in our study. A recently conducted animal study by Nylen et al  suggests that PCT might be a significant lethal factor during sepsis. In this experimental study, PCT significantly increased mortality in a hamster endotoxin shock model, and anti-PCT reactive antiserum was protective as to survival. In summary, PCT compared with CRP is characterized by its ability to be induced to very high serum concentrations also during advanced stages of MODS and severe systemic inflammation, respectively, whereas CRP is often already in the upper concentration range, even in patients with low severity scores, and exhibits no such further dynamics during the course of MODS and systemic inflammation. PCT more rapidly declines to the normal range during the recovery of the patient compared with CRP, and thus provides more information in patients with MODS and sepsis of various etiology than CRP. The absolute height of PCT concentrations in the initial period of inflammation was found to be less important than the further course of its plasma concentrations. The strong association of high PCT concentrations with both the SOFA and the APACHE II score indicates that not only sepsis-related score systems, but also a MODS-related evaluation of the severity of the diseases should be considered when PCT concentrations of different types of disease were compared.